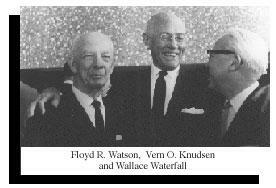 After exploratory inquires by Wallace Waterfall, Floyd Watson, and Vern Knudsen (pictured on the left), a group of some 40 scientists and engineers interested in acoustics met on 27 December 1928 at the Bell Telephone Laboratories in New York, NY, to consider forming a scientific society. 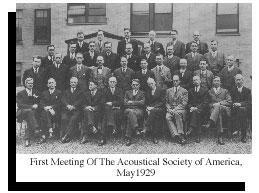 Plans developed rapidly and the Acoustical Society of America was formally organized and held its first meeting 10-11 May 1929 with a charter membership of about 450. In 1931 the Acoustical Society joined with three other scientific societies to form the American Institute of Physics, an organization designed to unite physics-related groups and to provide facilities for publishing and other common activities. The Institute now has 10 Member Societies covering a range of physics-related interests. During the 79 years since the Acoustical Society was formed, it has enjoyed a healthy growth in membership and in stature. The presentmembership of approximately 7000 includes leaders in acoustics in the United States of America and other countries. The Society has attracted members from various fields related to sound including physics, electrical, mechanical, and aeronautical engineering, oceanography, biology, physiology, psychology, architecture, speech, noise and noise control, and music. This diversity and the opportunity it provides for interchange of knowledge and points of view has become one of the strengths of the Society. Two meetings of the Society have been held each year, except between 1942 and 1945. Papers are presented concerned with architectural acoustics; psychological and physiological acoustics; applied acoustics; instruments and apparatus; music and musical instruments; noise; speech communication; ultrasonics, radiation, and scattering; mechanical vibrations and shock; underwater sound; aeroacoustics; macrosonics; acoustical signal processing; bioacoustics; and many more topics. To assure adequate attention to these separate fields and to new ones that may develop, the Society establishes technical committees and technical groups charged with keeping abreast of developments and needs of the membership in their specialized fields. An important element in the progress of the Society has been The Journal of the Acoustical Society of America (JASA). TheJournal began as a quarterly in 1929, changed to a bimonthly in 1947, and to a monthly beginning in January 1957. Its approximately 7000 pages per year contain many of the papers presented at meetings, other contributed papers, a bibliography of current acoustical literature and patents, and meeting programs. The Journal is available in print, on CD ROM and Online. Cumulative indexes of the Journal have been published, covering 10-year periods from 1929 to 1958, and five-year periods thereafter. In 2005 issues from Volume 1, Number 1 of the Journal were published online. In addition to its Journal, the Society reprints out-of-print classic texts in acoustics, translation books, and has also produced an Auditory CD, two videos on speech communication and various other publications. Tables of Contents and ordering information can be found under the Publications navigation menu. From the Society’s inception, its members have been involved in the development of acoustical standards concerned with terminology, measurement procedures, and criteria for determining the effects of noise and vibration. In 1932, The American National Standards Institute (ANSI), then called the American Standards Association, appointed the Acoustical Society as sponsor of a committee, designated as Z-24, to standardize acoustical terminology and measurements. The work of this committee expanded to such an extent that it was replaced in 1957 by three committees, S1 on Acoustics, S2 on Mechanical Shock and Vibration, and S3 on Bioacoustics, with a fourth, S12 on Noise, added in 1981. Throughout its history the Society has been fortunate in attracting the interest and commitment of a large group of men and women who have served diligently in various capacities. The unselfish activity of these individuals in the formation, guidance, administration, and development of the organization has been largely responsible for its growth and present standing. To these people and to the industrial organizations and government laboratories that have provided support to the Society, the Society acknowledges its indebtedness. These four committees are each responsible for producing, developing a consensus for, and adopting standards in accordance with procedures approved by ANSI. Although these committees are independent of the Acoustical Society, the Society provides the financial support and an administrative Secretariat to facilitate their work. After a standard is adopted by one of these committees and approved by ANSI, the Secretariat arranges for its publication by ASA through the American Institute of Physics. The ASA also distributes ISO and IEC standards. Abstracts of standards and ordering information can be found online. More than 100 acoustical standards have been published in this way; a catalog is also available from the Standards Secretariat (631-390-0215; Fax: 631-390-0217). The Society also provides administrative support for several international standards committees and acts as the administrative Secretariat (on behalf of ANSI) for the International Technical Committee on Vibration and Shock (TC-108). Members of the Society have for many years been involved in studies of noise, its measurement, its effects, and ways of reducing noise to improve the human environment. Papers on these subjects are presented regularly at Society meetings and published in the Journal of the Society. The Society recognizes distinguished achievement in acoustics by a series of awards. Recipients of the awards are listed on the Awards page. The ASA also awards fellowships and grants each year and details can be found in the Funding Resources page.